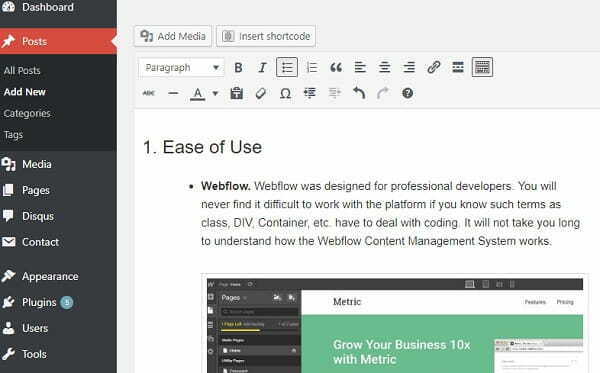 While WordPress is the open-source PHP-based content management system that does not need any introduction, Webflow has already made a name for itself as a popular cloud-based SaaS platform. It works as a canvas for professional designers focused on website’s semantic and visualization. Which platform is better to choose and why? Both are hardly a good alternative for users. They require some time and skills to learn how the system works. Webflow is a good tool to create production-ready websites from scratch without programming. It lets web designers and developers bring their ideas to life using Webflow as a canvas. The platform’s philosophy can be described as smartness without coding. On the other hand, we have WordPress delivering hundreds of free templates and plugins to build different types of websites effortlessly. While being a content management system, the platform has proved to be flawless for different online purposes like powerful blogging, eCommerce, and other fields of online representation. Both platforms have some obvious hits and miss making it harder for users to choose the best-matching one. What are their downsides? What are the pros? We have come up with a detailed overview of WordPress vs Webflow to highlight some of their benefits and possible drawbacks for users. Webflow. Webflow was designed for professional developers. You will never find it difficult to work with the platform if you know such terms as class, DIV, Container, etc. have to deal with coding. It will not take you long to understand how the Webflow Content Management System works. The platform looks familiar to professional designers as well who regularly work with editors such as Photoshop. The interface is pretty the same. You will to used to all available tools and section really fast to add different elements, style and position them. Webflow boasts an advanced Content Management System with its Site Editor that lets users add new content as well as reuse previous layouts and work in collaboration with other developers or designers. You can define the custom types of content whether it is a blog post, team member or project creating custom fields for each type. WordPress. The open-source nature of WordPress makes the platform a great choice for professional developers and designers. You have multiple ways to customize templates or writing the code for your future website using your HTML/PHP knowledge and numerous paid and free plugins. As an open-source platform, WordPress lets users handle the PHP and HTML editing. You can modify any template to create a unique style for the website. At the same time, you are free to add new blocks and elements. You will certainly need them due to the fact that most of the WordPress templates are pretty simple and all look alike. You might want some extra customization in addition to the solid HTML knowledge. Webflow vs WordPress: the two platforms establish different philosophies in reference to the website building process. We have WordPress featuring thousands of alike templates and the need to customize them with HTML/PHP knowledge on the one side. And on the other side, we have Webflow with its unique automated Site Creator and code-free manner. Ease of use is the issue where Webflow certainly takes the lead. Webflow. Professional designers and developers will appreciate the fact that Webflow is 100% White Label. It means that both freelancers and agencies can use platform facilities to offer their services. Webflow is a self-hosted platform. However, it does not mean you need to stick to it all the time. The software has export capabilities letting users replace the entire website code and host it somewhere else although it is hardly the best idea from security perspectives (we just mentioning the capability). If you are planning to run several projects at the same time, Webflow lets you switch between them as well as copy and paste your previous layouts. You can duplicate some elements as well as the whole pages from the previous project. The software delivers different built-in capabilities out of the box in addition to integrated hosting with a free integrated SSL certificate that does not require any prolongation. The distributed infrastructures and a built-in content delivery network are in the list of extra Webflow Hosting advantages that can improve the website performance. eCommerce feature is one of the most anticipated Webflow updates. The feature promises to let users build and grow shops with no coding and templates. At the same time, you can connect your website with social links and integrate your Facebook pixel to track the stats of your targeted ad campaigns as well as generate advertising efficiency. WordPress. You should consider that WordPress was initially designed as a blogging platform. It means that creating a unique website of any other type, you will need to do lots of coding in addition to an endless list of plugins. WordPress provides all plugins you may need. However, the more of them you have, the more updates you will need to make. At the same time, some plugins may contain malicious codes. It may have a negative effect not only on the website’s performance, but also on its search engine ranks, traffic, etc. Web developers will appreciate extra flexibility when it comes to hosting website. They can choose from multiple options as well as use their own servers to host the site’s files though the procedure requires extra costs and special skills. Additionally, WordPress can be integrated with any third party service and provides access to WordPress site database where you can work with file configurations and more. Webflow vs WordPress: WordPress look more complex, as you will need to build your website literally from scratch. There are no integrated services or pre-built plugins with the exception of some basic widgets. Missing some important elements such as spam protection, for example, may be to the detriment of the website performance. On the other hand, Webflow comes up with all necessary inbuilt capabilities including integrated hosting and digital security means. If you do not want to deal with the Site Designer, you can choose from a selection of ready-to-use 30 free and about 100 paid templates. Premium templates differ from free themes. They look more professional and functional. Webflow professional community has designed all available paid templates. It means no third parties and 100$ smooth running on Desktop and mobile devices. Animations feature certainly worth paying extra attention. Available at the “Interaction” section on the panel, it lets users bring to life practically all elements on their website pages. You can make animations for menus, blocks, content blocks, images, and more. The tool contains enough different options to animate up to 90% of the page content. WordPress. Despite numerous templates delivered by WordPress, they all look pretty much the same. Even premium themes are limited to visual effects. You can add parallax and some animations in your Theme Options settings. However, professional web designers and developers will hardly find it difficult to create a unique website. As an open-source platform, WordPress provides a full access to CSS files. It means that you can change the look of our website by changing its code without opting for a visual editor. Users can work with font color, typography, and general website performance. 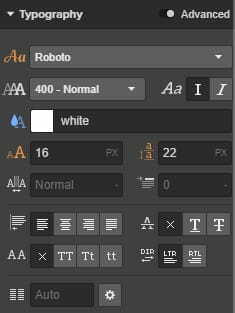 Advanced theme settings let you change typography, font color, title sizes, etc. You can customize some parts of the page, change header, footer or sidebar. Webflow vs WordPress: no matter how good you are at HTML/PHP editing, WordPress will hardly provide the same design freedom and customization tools as Webflow with its advanced Site Designer and Interactions feature. The platform makes it easy to create literally anything while the system will automatically publish and merge the data. Webflow. The platform boasts a huge knowledge base provided by its digital University. Here you can find all necessary information about how to get started with the website building in addition to design basics, hosting, integration, and more. 101 tutorial videos are available for visitors of the Webflow University. Apart from knowledgebase and video guides, users can keep in touch with the customer support via phone or live chat. WordPress. While being an open-source platform, WordPress does not have a customer support team. You can only count on the experience of previous developers and web designers who faced the same problems. As a rule, problematic issues are described on numerous forums available online in including the official WordPress.org community. WordPress vs Webflow: Webflow looks like a more informative platform with its own huge knowledge base, videos, online and phone support. On the other hand, users should be prepared to learn everything on their own when it comes to WordPress. Webflow. The platform has a FREE plan though it looks too limited. A user can create only two pages on the platform’s official subdomain. If you require to build a bigger project, you can opt for several paid plans that include Lite and Pro. This is where all the difficulties start. The situation with Webflow plans is a bit confusing. You might find it difficult to choose a proper plan. On the one hand, we have two clear paid plans: Lite ($16/mo) and Pro ($35/mo). On the other hand, here we have several groups of plans divided into 3 categories. They include a group for those who need only 1 site, for companies and for those who require regular design sites. In each group, you will find 3 more plans with different prices that range from $0 to $36. You will need some time to figure out which plan suits you most. WordPress. The platform is 100% free to use. However, you will have to handle lots of extra costs form a place to host your future website to paid premium themes and different extensions every time you want to take maximum from your SEO plugin. The final cost of building a website using WordPress can be even higher if compared with Webflow paid plans. It depends on the number of premium plugins you use. Moreover, you will need premium-quality hosting services to ensure website’s smooth running and performance. It will affect the price of the project. Webflow vs WordPress: Although WordPress seems to be a more cost-effective solution, using the platform might eventually result in higher project cost especially if you need a unique and solid website with good online performance. In this case, you will need additional premium plugins and reliable hosting facilities. These factors will also influence on the total website cost. From this point of view, Webflow looks like a better option due to its selection of plans with all necessary tools in the pack. After we have analyzed two platforms, we can conclude that Webflow seems to have a greater potential for web designers and developers to come up with a solid website. It has an array of custom development setups. It is more flexible and functional thanks to a combination of its Designer and Editor tools wisely integrated into the CMS. The reasonable pricing policy, selection of plans, integrated SSL security, and amazing designing tools put WordPress behind with its alike limited templates though the platform still reserves much customization freedom for developers. Webflow has more features of an advanced hybrid solution especially considering the upcoming eCommerce feature. Let’s hope for the best!